In this training you will to become a Mesa Carrier and learn the basic elements of shamanism and how to apply these techniques to yourself and others. You will be given the tools to journey into alternate realities, learn about your Power Animals, understand the messages in your dreams, cut cords to free yourself and others from unwanted relationships. You will build a Mesa or traveling altar to guide and empower you. You will be able to practice Peruvian Shamanic Principals in your life and start a journey to assist in the healing of others. This program is a prerequisite for the Pompamesayoq Ayllu. ​Dates: Saturday, March 23, Saturday, March 30, Sunday April 7, 2019.
skills and insights support healing for yourself and others. Archetypes: Amaru (serpent), Otorango (jaguar), Kuntur & Anka (condor & eagle). journeys to the 3 Worlds of the Shaman. 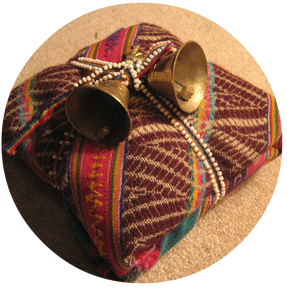 Create a Mesa, a traveling altar that connects the Shaman to the Luminous Threads of the Universe.The Shaman sources wisdom and healing energies from the sacred objects that have been gifted by power places, teachers, and others. With this sacred tool the Shaman is connected to their destiny and purpose for coming into this life. Cost for the Series is $450, if paid by March 20, 2019, $465 after the 20th. For further information or to sign up for workshop the registration by clicking on our button. Classes are held at the School For Shamanic Arts in Glendora, California. Level One is about Personal Transformation using Peruvian Andean Shamanic Tradition. Pompamesayoq is a caretaker of the Earth, they are healers and ceremonialists. The work of the Pompamesayoq is to master the elemental energies in nature and clear and awaken their Luminous Body. They no longer subscribe to their families myths or the myths of their society. In this work, you receive Rites to awaken your capacity to commune with the elements, the plants and the animal spirits. You master the art of tracking energy and understand how it organizes reality. You will learn how to retrieve lost soul parts and use a variety of modalities to help maintain these newly recovered aspects of the self. You will be a certified practitioner, healer and ceremonialist of the Pampamesayoq tradition. An Altomesayoq is one who Speaks Directly With Spirit. In the Andes, the Altomesayoq is one who has been struck by lightning three times and survived. In the school, this implies a complete release of your old identity and the acceptance of your destiny. The Altomesayoq is able to access past lives to recover the knowledge and skills they once possessed and can now use in their practice. He or She Is a practitioner of magic and divination, able to combat Sorcery and invoke Spiritual Beings for assistance in healing. You will be a certified Peruvian Shamanic practitioner able to use divination tools and channel directly from spirit to assist your self and clients.